Explorations in Quilting and Life: I am Back! 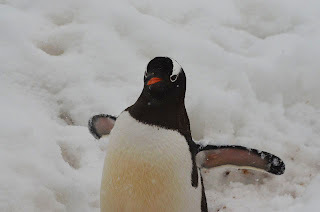 I am back from a trip to Antarctica! At least, I am physically back. Mentally, I am not quite adjusted to the good old USA. It was an amazing trip and I have far too many photos to sort through. I feel a bit like this penguin - a bit off kilter and just ambling along. Welcome back and Happy New Year, Judy!! I can't wait to hear about and see photos of your trip! Happy New Year to you too, Judy! I look forward to hearing about this trip soon. I so enjoy connecting with you via this blog and more....!